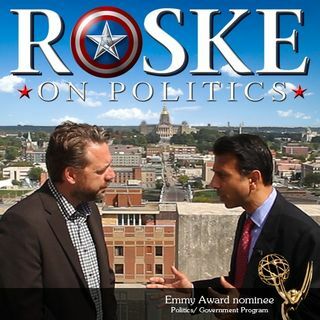 The Emmy nominated Roske on Politics airs every Friday at 11am CT featuring news, culture, wellness and social impact, broadcast from Des Moines and hosted by Brent Roske. Today at 11am CT: Political operative Robert Becker and I discuss his time with the Sanders 2016 POTUS campaign (that's him with the earphones in the photo below), if a Blue Wave is coming in the midterms and his outlook for 2020. The Emmy nominated Roske on Politics is focused on Iowa’s impact on the nation and we’re happy to ... See More have listeners from Hollywood studios to the White House. Previous guests include every 2016 POTUS candidate, members of US Congress, Oscar winners, business leaders, national journalists and more. Former gubernatorial candidate and host Brent Roske has been profiled in the New York Times, Hollywood Reporter, NPR, Huffington Post . Roske created the political drama ‘Chasing The Hill’ with Richard Schiff ('The West Wing'), has an Emmy Award, 42 Telly Awards and is a member of the Producer’s Guild of America. Beloved across the aisle, Gov Bob Ray exemplified what it meant to be a Statesman (his funeral is today). I'll run my interview with Gov. Ray, as well as a discussion with Henry Goodwin who was with Gov. Bobby Jindal's POTUS run. AARP's Anthony Carroll talks voter engagement & the founder of Progress Iowa, Matt Sinovic, on their upcoming adaption of 'Hamilton' called 'Reynold's Pamphlet'. Today at 11am CT: Congressional primary winner JD Scholten and the director of the new film 'Moss' Daniel Peddle (featured in Vogue: https://www.vogue.com/article/casting-director-daniel-peddle-independent-film-moss?mbid=social_onsite_twitter) . The producer of the new doc 'The Fabulous Allan Carr' ('Grease') Jeffrey Schwartz and the new Democrat nominee for State Senate District 21 Claire Celsi. Next week: Sec of State nominee Dierdre DeJear on her win. Gubernatorial candidate Ross Wilburn and his last push before Tuesday’s primary, Co-Director of Sankofa.org Gina Belafonte (founded by her father Harry Belafonte) and Becky Smith Pride Camp Director for the first LGBQT summer camp in Iowa. Iowa Secretary of State Paul Pate tells voters what they need to know about the new voter ID law before going to the polls June 5th, State Senator Dan Zumbach on his run to be the next Iowa Secretary of Agriculture and why education is so important to improve the quality of Iowa water, Iowa House candidate Reyma McCoy McDeid on her official request of the Iowa ethics board to include childcare as an acceptable campaign expense and Ross Trowbridge on mental health awareness and his #ProjectIAmNotAshamed. Oscar nominee & Golden Globe winner Sally Kirkland, filmmaker Kristian Day & music from Brent Roske's performance at the Grammy Museum. 4/13: Congressional candidate Pete D’Alessandro and gubernatorial candidate Marco Battaglia who will announce his Lt. Gov. pick live on the show! Des Moines Live is focused on Iowa's impact on the nation and we're happy to have listeners from Hollywood studios to the White House. Previous guests include members of US Congress, Oscar winners, POTUS candidates, business leaders and featuring local music from Nella Thomas, Field Division, Willie Wisely, Sven Olsen, the Awful Purdies and more. Hosted by Brent Roske (former host of the Emmy nominated series 'Roske on Politics'). Program airs every Friday at 11am CT.